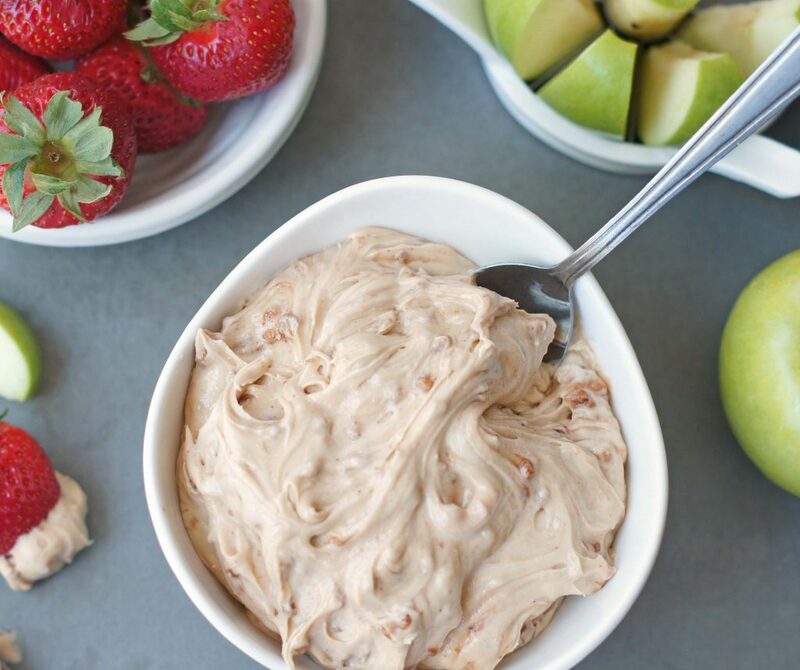 This Toffee Fruit Dip will absolutely become your favorite fruit dip ever. So addicting and insanely delicious! Quick and simple to make. 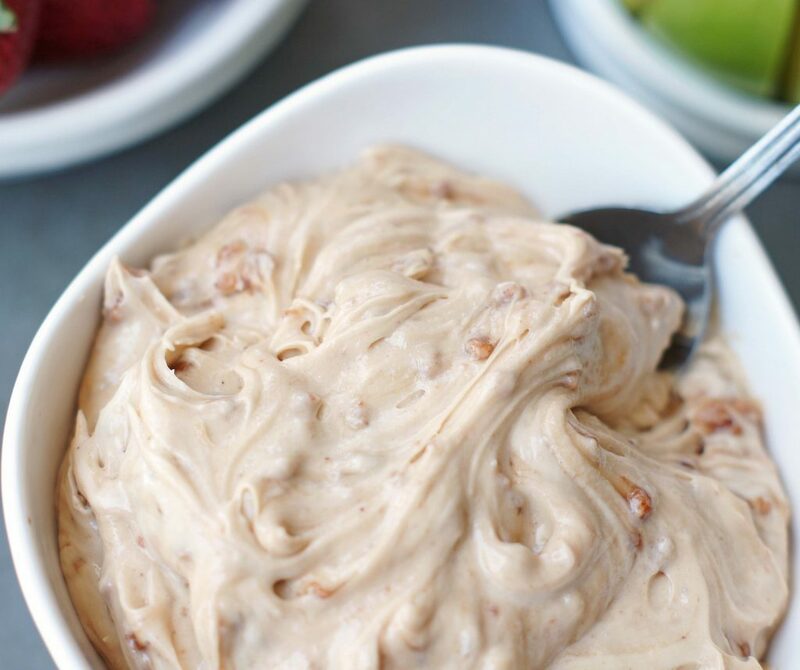 I scored this recipe for Cream Cheese Toffee Fruit Dip from my friend Heather probably over 15 years ago. It was love at first bite for all of us. I took it to family parties and my family all felt the same way about it. If we could marry it, I think we all would, especially my sister-in-law Becky. 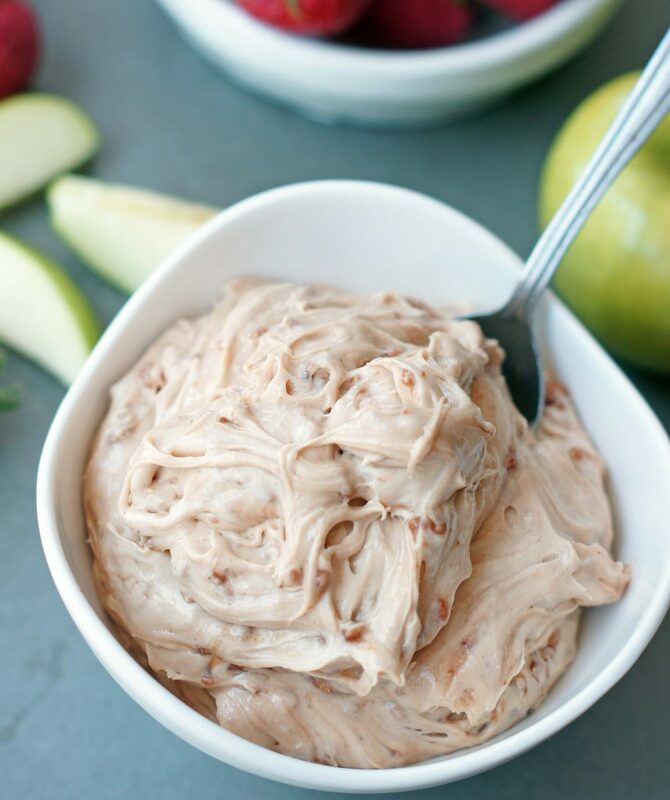 It’s so good we sometimes (ok, lots of times) just eat it with a spoon, no fruit even needed. Now let’s talk about toffee bits for a minute. For some unknown reason, Hershey’s stopped selling Skor Toffee bits in the United States several years ago (stupid!!!). I’m lucky enough to have a connection in the food industry who, years ago, was able to get me a case of them (thanks Evan!). Sadly I’ve used all those up and he could no longer get them so I’ve had to start using Heath Toffee bits. Now while they’re good, Skor bits are my favorite! Now, if you’re lucky enough to live in Canada you can still buy them there, they’re called Chip-its. You can find Skor bits on Amazon and a few other sites, but you might have to be willing to sell your firstborn to buy them (yes, they’re a bit pricey). Thankfully my good friend just got back from Canada and I conned her into bringing me some home . . . .thank you Janet! 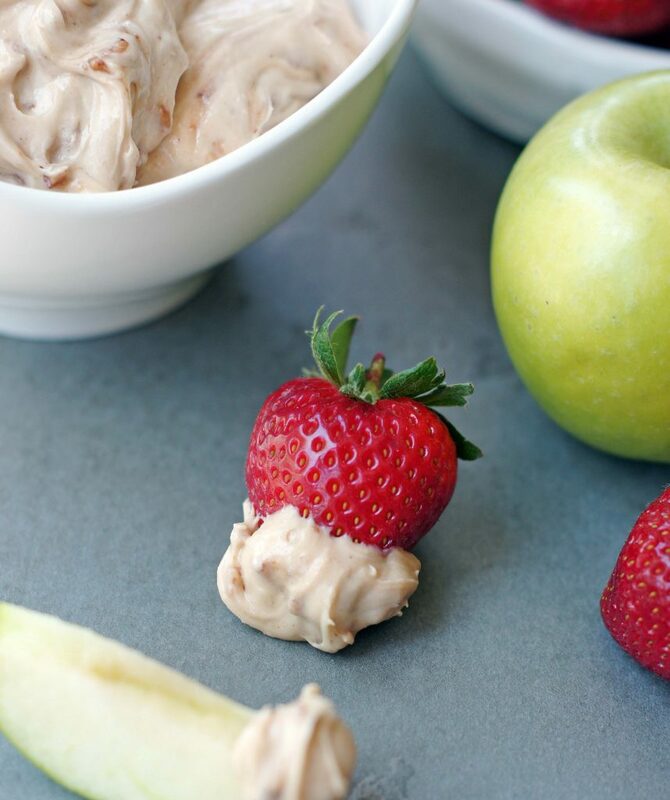 This dip is perfect for summer with all the fresh fruit everywhere. Apples are one of my favorite things with it, but it’s delicious with strawberries, grapes, peaches, watermelon, cantaloupe, etc. Make it several hours in advance because the longer it sits in the fridge, the better it gets. Try not to eat it all by yourself . . .share the yumminess. In a medium bowl combine cream cheese, brown sugar, powdered sugar and vanilla. Beat on medium speed until smooth and well combined. Add toffee bits and fold in until combined. Made this last weekend for a family event and had SO many requests for the recipe! Best way to eat a apple!